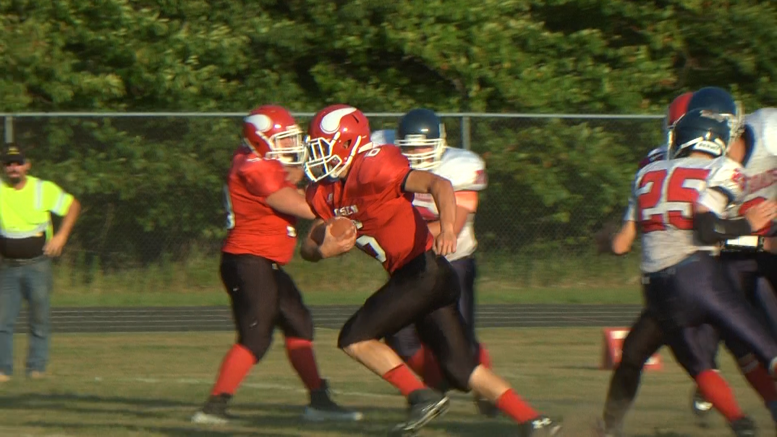 POSEN — The Vikings hosted the Big Rapids Crossroads Academy for week one of football and Posen took over on offense and defense. The Vikings were led on the ground by Mark Wisniewski who finished with 11 carries for 105 yards and 3 touchdowns. Chase Dubie had 7 carries for 112 yards and one touchdown. Tyler Hincka made 5 carries for 62 yards and one touchdown. The big catch of the game came in the first quarter when George Kroll found senior Sam Brunett for the 74 yard touchdown. The Vikings’ defense held the Cougars scoreless. Sophomore Gage Kaszubowski had a big hit in the second quarter that made the crowd roar. Posen topped Big Rapids 69-0. Fans can expect big things from the Posen 8-man team led by Head Coach Greg Pietsch.